The 203 Centre for Gender and Sexual Diversity opens today at the University of New Brunswick’s Fredericton campus. 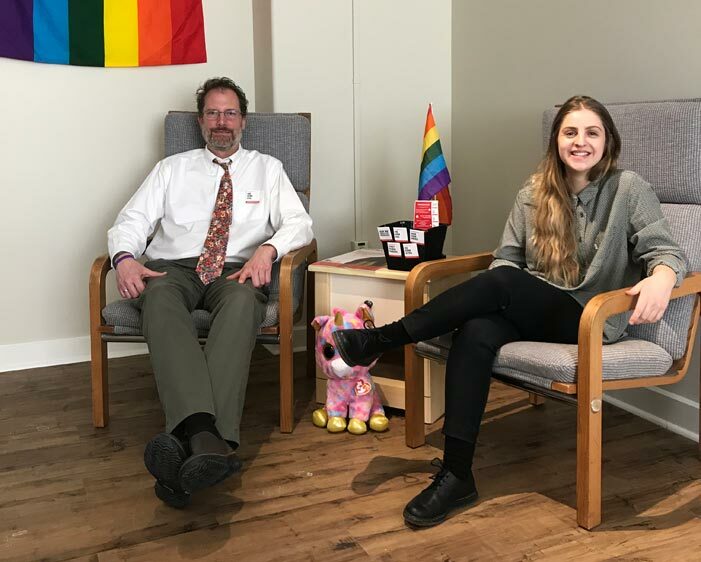 Run by an advisory board comprised of UNB students, faculty and staff, it provides LGBTQIA2S+ (lesbian, gay, bi-sexual, transgendered, queer, intersex, asexual, two-spirit) students, faculty and staff with a welcoming, safe, and comfortable place to gather and socialize. “The 203” is designed so that Student Services professionals, faculty advisers and others can meet individually with students using the centre. Dr. Rice Fuller, director of counselling services at UNB’s Fredericton campus, has played a significant role in establishing The 203. “We are very excited to be opening The 203 to the public today,” Dr. Fuller says. “The centre is a significant step towards our campus being a more welcoming and supportive environment for LGBTQIA2s+ students. “Research shows that providing this type of support for LGBTQIA2S+ students can improve both their mental and physical health as well as the mental and physical health of non-LGBTQIA2S+ students,” Dr. Fuller says. As a community-driven space, the advisory board is asking community members to come forward with suggestions and ideas on programming that The 203 should offer. Through these initiatives, the centre’s goal is to help foster a culture of advocacy with regard to LGBTQIA2S+ issues on the UNB campus. Nadine Violette is in her final year of studies at UNB’s Renaissance College, is president of Qmunity UNB, and coordinator of The 203. She says that LGBTQIA2S+ students across Canada encounter significant barriers related to their gender and sexual identities. “We want LGBTQIA2S+ students to feel part of a nurturing and accepting community,” Ms. Violette says. In collaboration with Qmunity UNB, The 203 launches a new campaign titled “We’re Here & We’re Queer.” The awareness campaign features 20 posters – each featuring a different LGBTQIA2S+ student, their name, preferred pronoun and a quote about the importance of The 203. The 203 Centre for Gender and Sexual Diversity is located in room 203 of the Student Union Building, 21 Pacey Dr. Hours will vary as it will be open on a volunteer-based schedule. Various group have helped fund the centre, including UNB Student Services, the UNB Student Union, the Office of the Vice-President (Academic) as well as private donors.